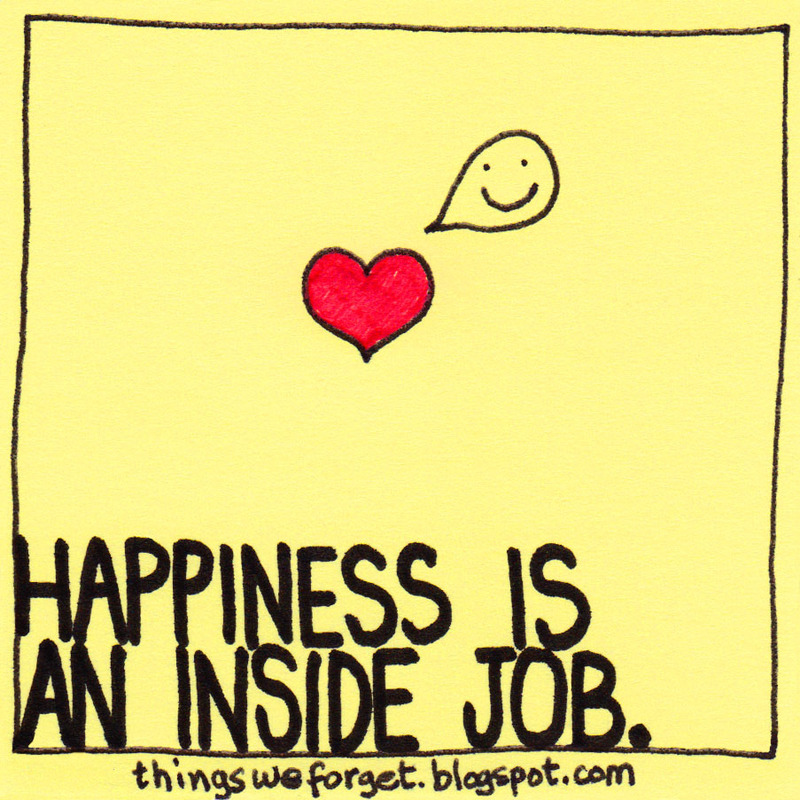 Fundamentally, happiness is an inside job! Happiness is just being. Being available to what is, being present in what is, being accepting of what is and moving on with what is. If we can’t understand the concept and value of just being, we simply will never be happy. In the July-August 2015 double edition of Harvard Business Review (HBR), Senior Editor Alison Beard writes about “The Happiness Backlash – Investigating the seemingly universal insistence on feeling good”.Reviewing a set of new books on happiness (mostly in the ‘Self-Help’ genre) and sharing her own perspectives candidly, Beard confesses that reading about happiness depresses her. “Because there’s too much advice out there about how to achieve it,” she explains. And she continues, “…And yet for me and many others, happiness remains elusive. Of course, I sometimes feel joyful and content – reading a bedtime story to my kids, interviewing someone I greatly admire, finishing a tough piece of writing. But despite having good health, supportive family and friends, and a stimulating and flexible job, I am often awash in negative emotions: worry, frustration, anger, disappointment, guilt, envy, regret. My default state is dissatisfied.” I feel sorry for Beard. That she has come to believe that her default state is one of dissatisfaction if not of complete unhappiness. To be sure, millions out there are unhappier than most others and, unfortunately, they remain unhappy almost perpetually. And the reason these people are this way is because they have not understood the value of just being. Fundamentally, happiness is an inside job. As Beard rightly surmises, just because there is a wave of activity in the “happiness industry” with books being churned out and people talking about it more and more – actually tweeting and #tagging about it – it cannot be assumed that the people of the world are getting any happier. No one – or no thing – can make you happy unless you learn to simply be – be with yourself, be with your true Self, be with what is, be yourself, be in the moment. And to be, you must understand Life. You must realize that Life does not happen because of you. It happens in spite of you. of what you do or don’t do. You cannot control the Life that’s happening to you. All you can and must do is to accept the Life you have, do the best in any circumstance and again be accepting of whatever outcome or result your efforts may generate. Per ancient Roman philosophy, the Goddess Fortuna, rotates the wheel of fortune, rota fortunae, of our lives. The wheel has the picture of a king on top and a picture of the same man as pauper at the bottom. So when the wheel of Life turns, as it surely will, you are pushed down if you are on top and you are pushed up if you are down. But we as people, as a race, we have all been conditioned to cling to the periphery of Life, holding on to the material aspects of our lives – power, wealth and assets. This basically means that as long as you are on the periphery of Life you will have to deal with the ups and downs, with the highs and lows, with gain and loss, with success and with defeat. But if you move inward, to the center of the wheel, you could be unmoved by all that happens to you in Life. In a way, at the center of the wheel is where the opportunity to move beyond mortal and material abundance transcending health, wealth, power, pleasure and fame is available. This is where you are in a state where you just accept what Life is offering you at the moment. Which is, kahbi khushi, kabhi gham – sometimes joy and sorrow. The nub is this: when you are accepting of the Life you have, of what is, you may feel the pain, but you will not suffer. You will learn to be in this material world and yet be above all the attachments that lure you and want to hold you hostage! There are only two ways to live Life. You can enjoy it. Or you can endure it. Enjoyment comes easily. When what you want comes your way, you enjoy it. But how can you enjoy death, separation, illness, misunderstanding, hatred, conspiracy, break-ups, loss, penury? These you simply have to endure. If you learn to just be, you can indeed be happy, even while you are enduring the Life that you never wanted, never wished or never expected. So, I would like to humbly disagree with Beard – even though she is one of my favorite writers at my favorite HBR. There is no backlash against happiness. There can never be – who will ever say no to being happy? Besides, happiness is not an industry. It is not a pursuit. It is a state. A state of being. Really, happiness is in you. You are unable to find it, or uncork it, because you have heaped layer upon layer of negative, debilitating emotions on happiness. To be happy, you simply have to be. When you are, accepting of the Life you have, no matter what the context or circumstance, you will find that all the negativity in you has evaporated. Or better still dissolved. When you are, you are in the moment, in the present. All your negativity stems from living in the past – anger, grief, guilt over what happened in a period of time that is dead, is gone – or from living in the future – worry, fear, anxiety over what may happen in a moment that no one has really known or seen. In the present moment there is no negativity. In the present, there is only one way, and that way is to simply be. When you simply are, you are happy! Author AVIS ViswanathanPosted on July 30, 2015 March 14, 2016 Categories Alison Beard, Art of Living, Harvard Business Review, Inner Peace, Intelligent Living, Just Be, Rota FortunaeLeave a comment on Fundamentally, happiness is an inside job!